No, not from me—Claudia Suzanne’s Ghostwriting Certification class needs manuscripts to work on. If you have a never-published book manuscript that you’d like some feedback on, contact claudia [at] wambtac [dot] com. And don’t worry, the students who will be working on the manuscript are all aspiring ghostwriters. They won’t take your work and try to pass it off as their own—their job is doing the opposite. This may be your last chance to take Claudia Suzanne’s entire Ghostwriter Certification Training course in one term: she’s training student teachers to take over GCT instruction. Claudia is brilliant, and it won’t be the same without her, though I’m sure anyone she trains will be competent, and her book is great to work from. Here are the details about the course. Ready to launch your new career? Join me for this last blast of eight (seriously intense) weeks and prepare to earn a professional ghostwriter’s income! Class size, as always, is severely limited. Sign up now to reserve your seat. I’m also talking to my colleague Max Hansen about helping entrepreneurs write articles for business journals. He has done this before with some success. Most of these journals are published by academic institutions, but the people we would be working for are not academics. If they were, they wouldn’t need help to be able to write in an academic style. Instead, they’re real-world experts who want to share their hands-on knowledge with an academic audience. They don’t need ghostwriters to be their brains, only to be their interpreters. Researchers within the academy can no doubt benefit from good editors—many write jargon impenetrable even to their peers—but the condition of promotion in an academic job is the production and publication of original research. Original. As in, you do it yourself. Depending on your field, you might actually be doing it with a team of junior assistants, but at the very least you are directing that team. I was trained as a classical philologist. That means I studied Greek and Latin language and literature. It’s not a discipline that accepts multi-authored papers for considerations of tenure. You and the primary sources and the secondary literature to which you are attempting to add have to sit down and wrestle your way to a new and preferably useful perspective on works more than 2000 years old. This can on occasion be a tiny bit challenging, so philologists seize eagerly on every fad in literary criticism—usually about 10 years after the English department has declared it passé. I thought I had a pretty good angle, myself (examining Greek and Roman drama through the lens of modern performance), but had to leave the profession about ten years ago with my dissertation unfinished and my hypotheses unproven. Academia is a tough row to hoe. Entry-level jobs set assistant professors Sisyphean tasks: they are supposed to simultaneously teach, publish, and do committee work. Even if they do all of this and have respectable peer-reviewed journal articles and a monograph by the time they’ve made it through six years, the university may decide to deny them tenure so it can hire someone cheaper rather than promoting them, and they’ll have to leave and start over somewhere else. That’s if a newly-minted PhD can get a job in the first place, of course. Small surprise that I know an English PhD working for a web design firm, a Latinist at ILM, and a Greek scholar building Lotus applications. Today I received an offer of work from a desperate young philologist whose name I won’t mention in the hopes that this person will see sense and opt out of career self-immolation. Let’s call this person “Ou Tis.” (Classics joke. If you don’t get it, read the Cyclops scene in the Odyssey .) Due to extreme pressure to publish, Ou Tis wanted to hire me to write articles for peer-reviewed journals, and eventually a book. Because of my background, Ou Tis thought I would be qualified to produce work of sufficient quality. Never mind the fact that I left academia in 1998 and am decidedly behind on current scholarship. I do live near an excellent research library. I could, in theory, catch up. First, I respect my former colleagues far too much to help someone I don’t even know get out of doing the work they had to do in order to get ahead in the profession. Second, though I think there are real problems with the tenure system and the expectations placed on junior faculty, cheating is not the way to fix it. Third, I can pretty much guarantee that Ou Tis doesn’t make in a year what it would cost to have me write an academic book, and it’s not as though the publisher is going to provide a huge advance. (The retail price of academic books is shocking, in part because print runs are so small, and in part because of the cost of photo permissions and other copyright clearances. Scholars do not get rich publishing books for other scholars.) So it’s not as though Ou Tis can even offer me a fee of a size that would provide me with an ethical dilemma. Read my lips, folks. No medical ghostwriting. No academic ghostwriting. There are times when you have to do your own work. If you want help popularizing that original research, now—then we can talk. One of the objections people have to e-readers like the Kindle is the restrictions the e-book format places on lending and re-selling books. While many authors and publishers might be just as happy if the used book market disappeared—particularly when they see the free review copies they sent out show up in the Amazon Marketplace—this is a legitimate objection. Digital rights management should not be so restrictive that owning a digital product is less convenient than owning a physical product. And I, for one, have discovered many favorite authors, whose books I now faithfully buy, at the public library. So before e-readers can enjoy a majority market share, the manufacturers and the publishers have to solve the e-book lending problem. Using a credit system as currency, the community provides a circle of eBook lending. Lenders earn 1 credit for every 5 books they list as available for lend and 1 credit earned for each successfully lent book. Borrowers create a queue of books they’d like to borrow. Lenders will be emailed or sent a text message when a Borrower selects their book and upon acceptance, they will have a set time to complete the transaction through Amazon.com or BarnesAndNoble.com with eBookFling verifying the transaction and alerting the requester that their book is ready to download. The Borrower will then have one point deducted from their account which is given to the Lender to spend on a rental for him/herself. The borrower may read the book for 14 days on the device they’ve downloaded to (Kindle, Nook, Nook and Kindle apps on smart phones or apps on PC and MACs) upon which the book disappears from the borrower and is “returned” to the Lender’s device/phone/computer. HOW ANGRY WILL THIS MAKE AMAZON, B&N and PUBLISHERS? The initial reaction may be a negative. Publishers and authors will claim the lending feature is being abused and causing cannibalization of sales. Authors are already bending over backwards by giving away many of their backlist (older) books free in the Kindle & Nook stores as promotion for the author’s new release. From their perspective, now they’ll have to worry about making only half the sales on the new books too!? Plus, the 14-day lending period may be more than enough time to finish a short novelette, copy the recipes in a cookbook, or read that important chapter in a tech manual or how-to book; never needing to purchase. But it’s ridiculous for publishers to gibber about “lost sales” from library users. The type of library user who would read the book once, return it, and have no further use for it, would never buy the book in any format. Some of us simply read too fast and too much to make it practical for us to buy all the casual fiction that passes our eyeballs. Apparently the Open Library initiative from Archive.org has also been around for a few months, but I just happened across the announcement today while looking up the link to their audio hosting service. San Francisco, CA – Today, a group of libraries led by the Internet Archive announced a new, cooperative 80,000+ eBook lending collection of mostly 20th century books on OpenLibrary.org, a site where it’s already possible to read over 1 million eBooks without restriction. During a library visit, patrons with an OpenLibrary.org account can borrow any of these lendable eBooks using laptops, reading devices or library computers. This new twist on the traditional lending model could increase eBook use and revenue for publishers. Any OpenLibrary.org account holder can borrow up to 5 eBooks at a time, for up to 2 weeks. Books can only be borrowed by one person at a time. People can choose to borrow either an in-browser version (viewed using the Internet Archive’s BookReader web application), or a PDF or ePub version, managed by the free Adobe Digital Editions software. This new technology follows the lead of the Google eBookstore, which sells books from many publishers to be read using Google’s books-in-browsers technology. Readers can use laptops, library computers and tablet devices including the iPad. Digital lending also offers wider access to one-of-a-kind or rare books on specific topics such as family histories – popular with genealogists. This pooled collection will enable libraries like the Boston Public Library and the Allen County Public Library in Indiana to share their materials with genealogists around the state, the country and the world. Libraries interested in partnering in this program should contact: [email protected]. The announcement mentions two publishers enthusiastically participating in this program, Cursor and OR Books. I confess to not having heard of either of them, but want to applaud them both. (Cursor turns out to be a fairly new venture by Richard Nash, with a first imprint called Red Lemonade and a forthcoming “social publishing” platform; OR looks cut from the same cloth, judging by its “about us” page.) Clearly both houses see the advantages of reaching new audiences through libraries. And the libraries themselves see a way to give new life to books that had become too fragile to loan—and which are probably out of print, so buying a new copy for circulation is no longer a possibility. Yet more books that the publishers would never be able to sell, unless they now take the digital versions and make them available by POD—in which case, the library initiative may turn into a source of new revenue. It’s time to quit treating libraries and their patrons like freeloaders. Libraries are some of the best advocates authors and publishers could possibly have—especially as bookstores disappear. 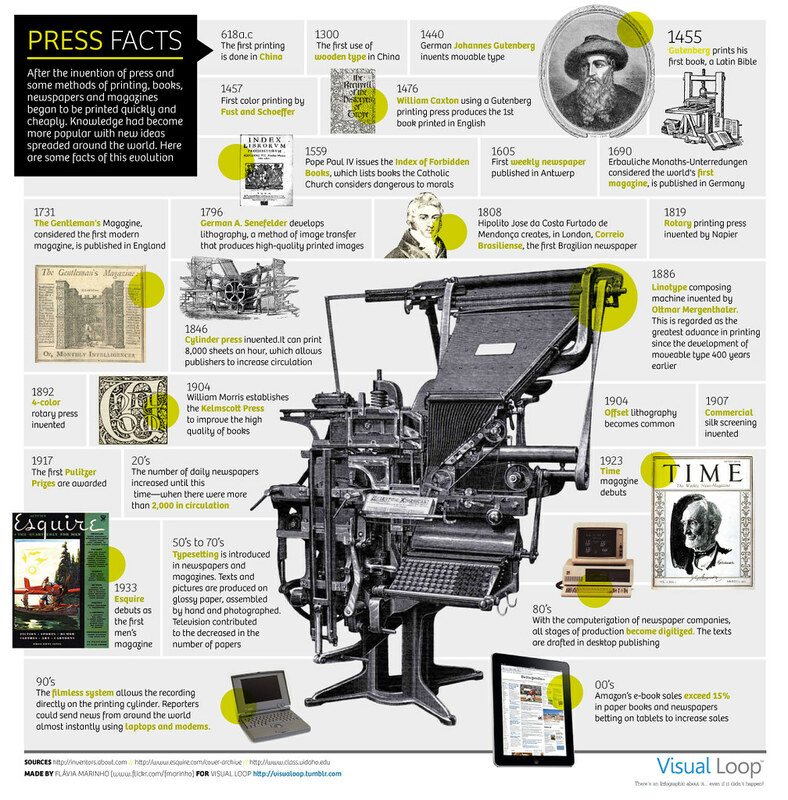 The large contraption in the middle is a linotype composing machine from 1886. Wikipedia has a fascinating description of how it works. The reference to a filmless system in the 1990s shows a Mac PowerBook that looks remarkably like Prometheus, my old 145B from my graduate school years. I still remember people talking about “camera-ready copy” in those days, though. Human proofreaders will not be out of work for a while. Hat tip to Nancy Friedman for posting this to Twitter. Whether you want to change your freelancing status, enhance your income, or just improve your writing skills, Ghostwriter Certification Training is the pinnacle of writing classes. You won’t find these clear-cut techniques for writing, editing, and submitting novels and nonfiction anywhere else—nor the unique ghostwriting skills and proven “insider” secrets that can transform a run-of-the-mill freelancing career into a $75,000 – $150,000 or more Writing Professional career. Classes start next Monday, March 7. Go to http://claudiasuzanne.com/gct for details and registration, or call toll-free at 1-800-641-3936. Class size severely limited. Claudia Suzanne has ghostwritten more than 100 books, both fiction and non-fiction, and she really knows her stuff. Plus, she’s been teaching for years. Not all those who have a skill can teach it, but Claudia can. You can’t do better than to learn from her. And no, I am not getting a kickback for recommending these classes. I just think Claudia rocks. Brilliant, funny, insightful treatment of what changing publishing technologies mean to authors. My favorite quote so far: “Every tool has three sides: the sharp side, the dull side, and the stupid side—the side that has consequences you didn’t intend.” The illustrations are hilarious. From the O’Reilly Tools of Change for Publishing conference 2011. Thanks to the clever folks over at Windows Secrets, I’ve just found the missing link in the e-book/e-reader revolution. One thing that fueled sales of the iPod, apart from the convenience of buying songs from the iTunes store, was the comparative ease of transferring your existing music collection onto this little electronic device. By the time the iPod hit the market, music was already digital. You could stick your CDs into your computer and “rip” the music from them into MP3 format in a matter of minutes. There was no need to go out and buy music you already owned in the new format. Am I going to buy 500 books all over again at $9.99 a pop? Not too likely. Especially if I don’t really own the electronic version, which one doesn’t with the Kindle. But it’s no mean feat to “rip” my paper books onto an e-reader. It would be an enormously tedious process with my current scanner. It’s not as though I could stuff a paperback through the sheet feeder. Ion Audio demonstrated a device at CES that begins, at least, to address this problem. They call it the Book Saver, and it’s meant to scan books quickly without destroying them. With the growing popularity of e-readers and digital books, ION has created the fastest and most convenient system for transferring novels, textbooks and periodicals to the digital realm. Book Saver allows everyone to easily transfer their favorite stories directly to a convenient SD cards. Once converted, the books can be quickly transferred to a computer or e-reader. Book Saver is the only device needed to quickly make all your books, comics, magazines or other documents e-reader compatible. Book Saver has two cameras that take separate images in rapid succession of each page within an open book. You can scan 200 pages in less than 15 minutes! Book Saver’s cradle, where the book is placed during the scanning process, is also angled as to not require you to hold pages down to get a flat, even surface. While similar devices require up to seven seconds per one page, Book Saver takes only one second per two pages! That’s pretty impressive, though it would still be quite a job to scan even my collection of novels. But if I didn’t need to do them all at once, it could be workable. Scan a handful of books before a trip, or take an hour or two every week until they’re done. According to USA Today, Ion expects to price the BookSaver at $189, which is pretty reasonable, though there’s no price listed on the site. The BookSaver won’t be available until later this year. If it takes off, we can probably expect to see other manufacturers produce similar devices, and even some improvement in the technology. Book publishers will likely wail about piracy, but they already do that, and books were pirated before the Kindle was a gleam in the eye of Jeff Bezos. There’s a sound legitimate use for the BookSaver, and it could boost sales of e-readers among some of the biggest book buyers in the world. I remember when Borders was a fabulous independent bookstore in Ann Arbor, Michigan. When I arrived at the University of Michigan in the fall of 1989 to start graduate school, Borders seemed like heaven. The size of the Classics section was jaw-dropping. I did almost nothing to resist temptation, and spent far too much of my fellowship money on books, then and thereafter. Not until moving to Berkeley was I so blessed with regard to local bookstores. I was shocked and horrified in 1992 when I learned that Borders had been bought by Kmart. Kmart was cheap, mass-market, strip-mall, low-price, low-value, disposable goods. Borders was unique. It had style, personality, place. It was intellectual, scholarly, full of rare academic books that wouldn’t be of the least interest to the average Kmart shopper, many of them imported. But all that happened in the short term was that Borders moved from State Street to Liberty Street, to occupy a larger space and expand its music collection. It was just as good a place to shop for books on Greek tragedy. I visited my parents in Ohio and found a Borders in a strip mall. It didn’t much resemble the Borders in Ann Arbor. It had a coffee shop in it. And a lot of books on the best-seller list. I left Ann Arbor and moved to England in 1994. When I came to San Francisco in 1998, I found a Borders in Union Square. It had a coffee shop. Apart from that, nothing much distinguished it from Waterstones, the big chain in the UK. (Well, they make paperbacks in a slightly different size there. And they charge more money for them.) It wasn’t half as interesting as Black Oak, or Moe’s, or Cody’s, or Pegasus, or the Other Change of Hobbit, or any of the independents in Berkeley. Most of which are closed now. But as a place to meet people, and for selection, the Borders in Emeryville is vastly superior to the Barnes & Noble here in El Cerrito. Better seating. More power outlets. Free Wi-Fi. Definitely more books, though I confess that when I buy books locally, I most often buy them used, and I’m as guilty of buying from Amazon as the next person. The coffee shop is usually busy; the store itself, less so. Now Borders is preparing to file for Chapter 11 bankruptcy. 200 stores are expected to close immediately, with more likely to follow. I will grieve if the Borders where I like to meet clients closes. But I grieve more for the Borders of my memory, that catered so spectacularly to the needs of local customers.